The B12 Boost is a vitamin and nutrient IM injection formula for those of us who continue to feel fatigued and exhausted after already filling ourselves up with coffee. The B12 Boost is a master at boosting your immune system and increasing your energy and focus, helping you kick perpetual grogginess to the curb. It is perfect after a super-exhausting long weekend or right before a strenuous workout. How Does the B12 Boost IM Injection Work? 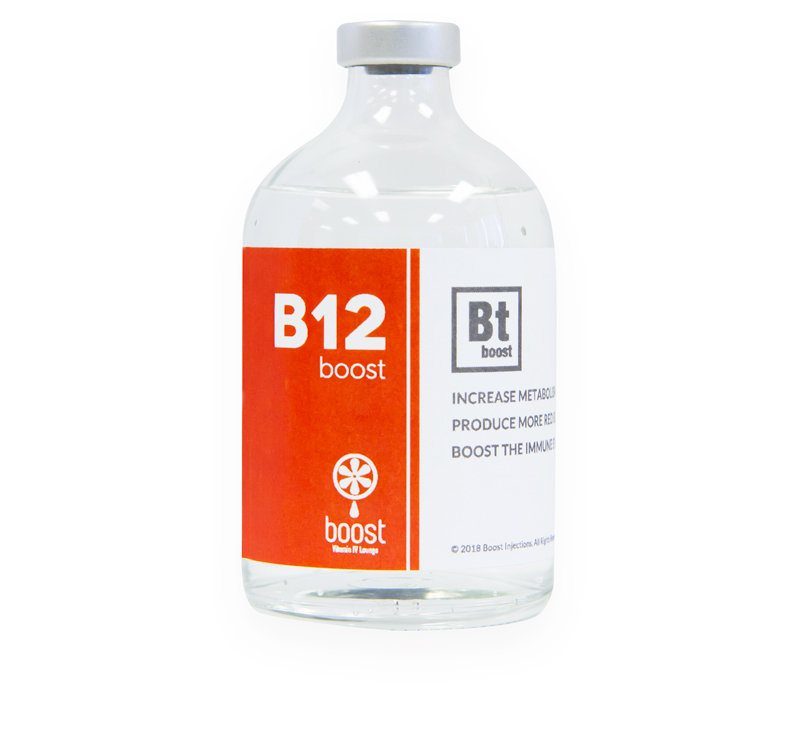 The B12 Boost is made from Vitamin B12, an essential vitamin that produces digestive enzymes and carries the important nutrients in and out of our cells. This vitamin is considered to be one of the most common nutrients that humans suffer a deficiency from, so it is a vitamin that is commonly supplemented. The B12 Boost is an intramuscular injection, providing your body with increased absorption, giving you immediate, long-lasting energy. Q: What can I expect from an IM Injection Booster shot? A: IM injections deliver vitamins and nutrients to your body for maximum absorption by injecting deep into your muscles. Since muscle tissue has a greater blood supply, it can hold more of the nutrients injected into it, helping to provide maximum benefit and results. Q: How do IM Injection Boost shots work? A: IM Injection Booster shots work by administering vitamins and nutrients directly into your muscles, so that there is no GI metabolism, allowing maximum absorption of vitamins and nutrients. Common areas of your body where IM injection Boost shots will be administered include the deltoid muscle of your arm, your upper thigh, and the ventrogluteal muscles of your buttocks. Q: How long does an IM Injection Boost shot take to administer? A: One booster shot takes only seconds to inject and will last you for at least a week.